A lot of people wondered what NamesCon would do with the DOMAINfest brand when they bought the rights to that conference from Oversee.net at the end of last year. Since then some successful one day DOMAINfest events have been staged in conjunction with other meetings (with another one set to run Sept. 27 alongside THE Domain Conference in Florida). 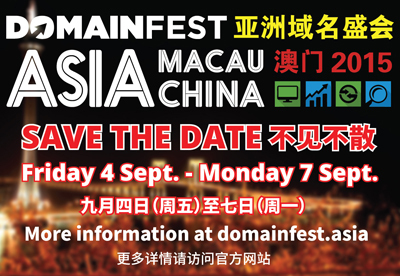 Now, DOMAINfest is spreading its wings even further with a big four-day event - the first DOMAINfest Asia - that will run September 4-7, 2015 in Macau, China. access for our many friends in the China region, the Indian subcontinent, Japan, Korea, and south-east Asia." The conference will be jointly organized by DOMAINfest, DotAsia Organisation (the operator of the .ASIA registry) and China-specialist strategic communications agency Allegravita and it will be supported by the Internet Society of China. DOMAINfest.Asia 2015 is designed to serve as a meeting place for China’s and Asia’s domain name industry to network with sector leaders from around the world. The show will feature the parallel discussion tracks made popular by NamesCon on diverse domain name industry subjects topical to Asian and Chinese markets. 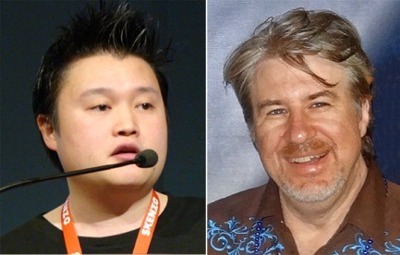 DotAsia CEO Edmon Chung (left) and Allegravita CEO Simon Cousins have joined forces with DOMAINfest to stage the first DOMAINfest Aisa conference in Macau Sept. 4-7, 2015. A full conference schedule and sponsor details will be announced in coming weeks, and full event information will be available online soon at http://domainfest.asia.